As a deer hunter, I read a lot about where to hunt big whitetail bucks. Over the years Ive noticed that most articles on that topic are vague. Statements like, Iowa is a great state for huge bucks are common. I wanted to know which counties are breaking records, and why some counties produce more big deer than others. I also needed maps, since they are more useful and informative than lists. Dissatisfied with what I read, I decided to see if I could do better. The first step was record book data from the Boone and Crockett Club. Jack Reneau, Director of Big Game Records, provided the information I needed and explained how it was organized. I assembled 5,568 whitetail entries spanning the years 1830-2001 (only two entries were included from 2001, and only 120 from 2000). I successfully entered 5,439 entries into a Geographic Information System (GIS) that allowed me to produce a variety of maps and analyze the data. I did not include 129 entries lacking county-specific information on where the deer was taken. The information and maps shown here are based on the 5,439 deer entered into the GIS. I had initially planned to produce one map showing the distribution of all the entries, but I noticed that the distribution of entries had changed over time. I decided to divide the records book into two time spans, 1830-1979 and 1980-2001. The former provides a historical account of deer herds in the United States, while the latter gives hunters an up-to-date map on which areas are currently producing numerous B&C entries. 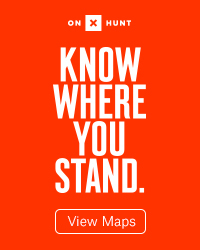 The 1,489 entries mapped from this early period comprise 27 percent of 5,439 total entries. Thirty-nine states and 663 counties appear, the top three states  Minnesota (315), Wisconsin (194), and Texas (157)  accounting for 45 percentof all entries during the period. Montana, Arkansas, and South Dakota popped up in the top 10, while states currently hailed as big buck meccas, such as Ohio, Illinois, and Kansas, recorded relatively few entries. The most productive county during this period was northern Minnesotas St. Louis (39), followed by south Texas Webb (27), and Minnesotas Itasca (20). The top 10 counties during this period are in Wisconsin, Minnesota and Texas. 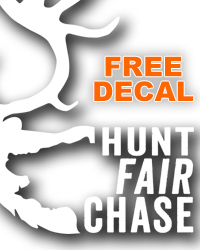 Click here to download the whitetail distribution map for your desktop! 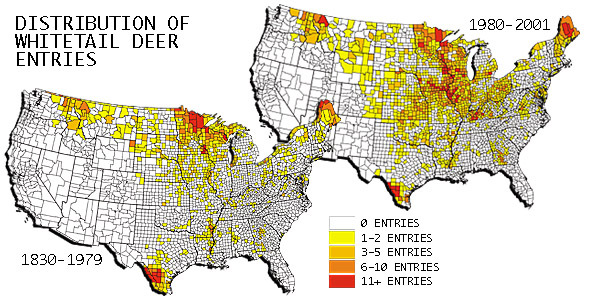 The distribution of entries from 1830-1979 reflects the history of whitetail deer in the United States. During the late 1800s and early 1900s, whitetails were extremely rare in many states and had become extinct in some. Conversion of land for agriculture, deforestation, and unrestricted market hunting are some of the reasons for this decline. During this period, whitetails in agricultural states were especially vulnerable, as much of the land was cleared. Some deer herds did not return until recently. Ohio did not have a modern firearms season until 1943; and in Iowas first modern deer season, in 1953, hunters took only 4,000 deer! Other states have similar histories, helping to explain the lack of entries during this time period. In contrast, whitetail deer survived in greater numbers in states with remote, forested areas. Minnesota, Wisconsin, and Maine are good examples  so too areas like south Texas, the Rocky Mountain Range, and the Mississippi Delta region. One interesting place is the Driftless Area of west-central Wisconsin and southeastern Minnesota. This region was not glaciated during the last ice age. Its landscape of forested hills provided food and cover, where deer survived and where they still grow big. Buffalo Wisconsin is in this region, and stands as the all-time most-productive county with 62 entries. 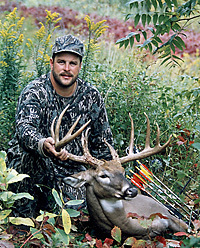 Bruce Norton with his typical whitetail deer scoring 168-3/8 points. This buck was taken in Houston County, Minnesota, in 1995. During the last two decades, the range and total population of the whitetail has expanded immensely, with managers now working to either stabilize deer populations or reduce them. With increasing numbers of deer came more interest in trophy-class deer. The 3,950 entries (74 percent of the record book total) come from 41 states and 1,254 counties. Incredibly, the years 1990-2001 account for 2,811 or 52 percent of the record book entries during this period. Distribution has shifted to include the mid-western states, where deer herds are growing, aided by excellent habitat. The top 10 states are IL (509), IA (507), WI (395), MN (293), MO (244), KY (242), KS (235), OH (199), TX (159), and IN (138). The map shows the dominance of Midwestern states during the last 20 years, especially the last decade. States and counties that yielded many entries during the previous period have, by and large, continued to produce; but they account for a smaller percentage of entries. The top 50 counties are distributed in the following states: IA (17), IL (11), WI (6), KY (4), MN (4), TX (4), ME (2), MI (1), and MT (1). Twenty-eight of the top 50 counties come from Iowa and Illinois, which is why these states attract hunters. For some states, the last 20 years account for nearly all of their entries. For example, Kansas recorded 235 Awards Book entries during this period, and 255 All-time entries, while Kentucky had 242 and 279, respectively. Mapping all 5,439 entries gave me a print similar to the 1980-2001 map, since the vast majority of trophies come from that period. Forty-two states and 1,443 counties produced entries, with most coming from the top 10 states: IA (615), MN (608), WI (589), IL (552), TX (316), MO (285), KY (279), KS (255), OH (235), and MI (155). These 10 states accounted for 3,880 entries, or 72 percent of the record book. The all-time best counties are Buffalo, WI, and St. Louis, MN with both recording 62 entries. The top 50 counties are distributed in the following states: IA (13), MN (12), WI (10), IL (8), TX (5), ME (1), and MT (1). Why do some counties produce so many entries? Answering this question is difficult since so many natural and man-made factors come to bear. Still, the relationship between record book entries and river systems is plainly evident throughout the country, especially in heavily farmed states. For example, in Iowa the best deer counties are not the most heavily farmed, but tend to have a mixture of farmland and forest cover associated with river bottoms. Counties bordering the Missouri, Mississippi and Des Moines Rivers account for the majority of entries from Iowa. This pattern is evident in nearly all states, especially along the Mississippi, Ohio, and Missouri River systems. The relationship between deer densities and number of entries is also interesting. States with high deer densities and long firearms seasons with liberal bag limits produce, on balance, fewer entries. States with lower deer densities, shorter gun seasons, and more restrictive buck harvests tend to produce more entries. A good comparison is between Ohio, which averages around 10 deer per square mile, and Mississippi, which averages more than 30. 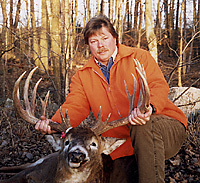 This non-typical whitetail was taken by Ronald J. Jilot in Buffalo County, Wisconsin, in 1997. The buck scores 203-5/8 points. Perhaps the most interesting pattern is the impact state management practices can have on entries. In Kansas, modern rifle season takes place after the rut, while in Oklahoma it generally falls during the peak of the rut. 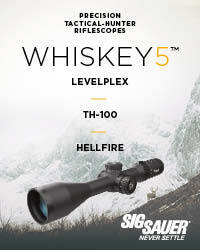 Also, the black powder season in Kansas is in mid-September, when the trees still wear leaves and temperatures are high. In contrast, Oklahomas black powder season occurs in late October and early November, when temperatures are cool, bucks are starting to rut, and the leaves are falling. Since the majority of bucks killed are taken during gun seasons, timing those seasons so bucks are less vulnerable gives the animals time to mature. Similar differences are apparent between seasons and the number of big-buck entries from Iowa and Missouri, Ohio and West Virginia, and Nebraska and Kansas. The maps produced for this article give hunters an accurate picture of where B&C-class bucks are being taken. Though your odds are definitely higher in certain states and counties, the maps also show that entries come, literally, from all over. They have come from 1,443 different counties, half the counties in the forty-two states that have produced entries. So no matter where you hunt, there is always a geographical chance of bringing home a record book buck! Join the Boone and Crockett Club's Associates Program Today.